I have traveled twice on the Coastal Express (April 2006 onboard the MS Lofoten and December 2010 with MS Polarlys), and twice on the MS Fram (Feb 2009 in Antarctica and September 2011 in Svalbard). I am getting ready for a new trip aboard the MS Lofoten (love this ship) departing Bergen March 3rd. I am a French woman and I also live in Brittany (90km south of Saint Malo). I already really enjoyed reading some of the discussions here and looking at beautiful pictures, and I hope I can contribute a little bit in the future! Hi Sarnia! Welcome to CVF. I look forward to having time to look at your blog slowly soon! There are some fantastic photos on the little bit of it I've seen so far. Hallo Sarnia, how good to see you on CVF. I know you'll enjoy exploring the threads here and I look forward both to seeing your posts and also the accounts of the travels on your blog. A warm welcome to us here at CVF, and hope you find many interesting threads to both read and perhaps post your own words and pictures into. Hi, and a very warm welcome to CVF. There's really a lot of things to discover here! I had a brief look in your photoblog, lots of nice pictures there. A big welcome aboard from me too Sarnia. A warm welcome on board this very friendly forum, to you as well Sarina. I hope and trust you will find your stay with us fun, educational and very addictive. Really looking forward to seeing you around! Bonjour and WELCOME, Sarnia!!! Glad you are with us! kiki42, I am indeed close to you, actually I have a sailboat in Granville (near the Mont Saint Michel) and I sail to the Channel Islands at least once a year! (and my nickname comes from the roman name of Guernsey). Great to have one more sailor around here! May I ask what kind of boat do you have? I sail a Swedish 25-footer, a Albin Express. It's by the way named 's/y Tiger'. 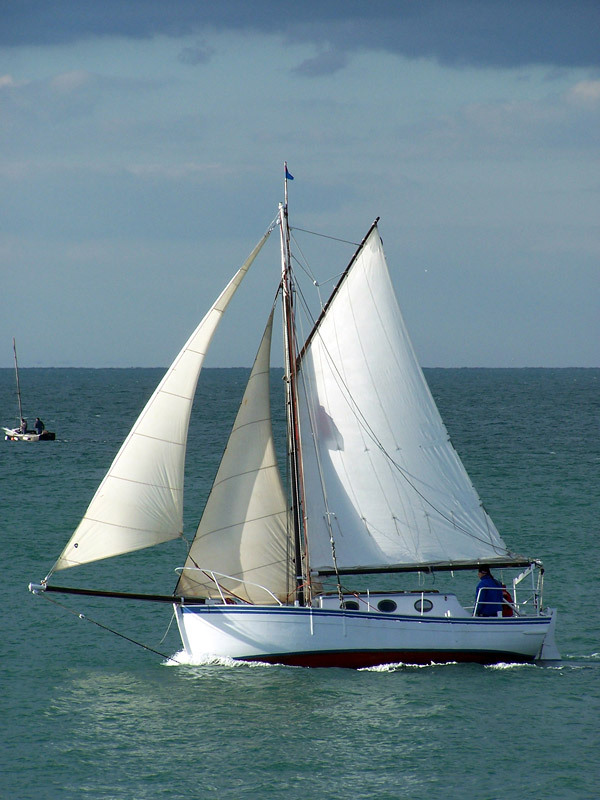 My boat is a traditional wooden sailboat (based on the traditionnal fishing boats from the Mont Saint Michel area), 23 foot-long, a gaff-rig cutter, one of a kind! She is 60 years old this year and still in very good shape! Last edited by Sarnia; February 8th, 2012, 14:10. OOh- Photos please, Sarnia--she sounds lovely!!!!! Thats very interesting, and you must let me know when you will be in Jersey again, and we can say " Hello " its nice to be able to meet up with other members. It was a windy day so the mainsail had been reduced.